One thing that can ruin any trip is getting to your destination and discovery that your luggage is lost or that you have the wrong luggage. 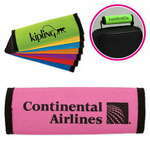 With more and more luggage and travel bags looking the same, baggage mix-ups are more and more common, making a branded luggage tag from Promotion Pros a great, simple gift that you can give to customers, potential clients, and staff to make their traveling just a little bit easier and to remind them of your quality service every time they travel. 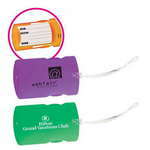 The promotional 1/16" thick printed luggage tag is durable and lightweight. 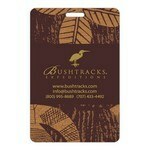 Our personalized 1/16" thick printed luggage tag with business card insert is durable and lightweight. Keep your Luggage safe and secure at all times with the Alpha™ Luggage Tag. Add a bit of class to your luggage when travelling with this faux leather tag. Keep your Luggage safe and marked at all times with the Alpha™ Two Luggage Tag. 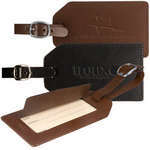 The luggage tag is made from faux leather material. 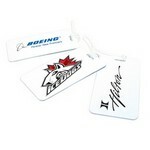 This custom luggage tag features a single promotional logo imprint and durable plastic design. 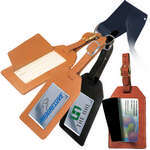 This custom luggage tag features a single promotional logo imprint and comes in several color choices. Made in the classic black colour, the Freedom Swivel Hook Leather Luggage Tag with your logo imprinted makes for a fantastic give away for both its looks and utility. 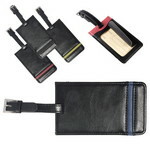 Crafted from black cowhide luggage tag with brushed silver swivel hook clasp, it also features a leather flap that covers the acetate viewing window for business card or ID card. Tag along with this Full Color Bag Tag on your next travel in distinct style. This stylish bag tags is ideal for writing down your address and travel in absolute safety. These tags with their stylized looks and your company logo neatly imprinted can become a great promotional tool at all your marketing conventions. The shining metal buckle on the Grand Central Leather Luggage Tag adds to its elegance and functionality and is crafted from cowhide leather with a leather strap. 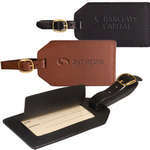 The Grand Central Luggage Tag which is crafted from sueded full grain leather with leather strap and metal buckle looks classy with your logo neatly imprinted onto it to give a boost to your marketing efforts. 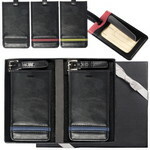 Available in the classic black and tan colour options the Luggage Tag can hold identity card or business card behind the acetate viewing window on back panel hidden by leather flap. 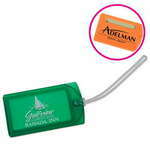 This custom luggage grip tag features a single promotional logo imprint and allows for easy luggage handling.